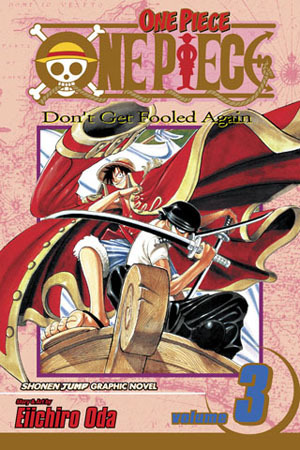 Luffy takes a back seat in this volume, so it jumps around between Usopp and the others. Even the weak little princess actually tries to do something, but she’s too young to deal with the burden if taking another’s life. I knew Oda worked for Watsuki, but I didn’t realize he’s worked with several big name mangaka. I guess all that experience really paid off to make One Piece a hit! Wow, Usopp’s pirates have been around for five years. Bravo, crew, not many other kids stick with something for that long. Also, Carrot is obviously training to join the army of the kingdom in Tangled, not run a tavern. By the way, doesn’t the world look amazing in Kingdom Hearts III? Well, Luffy gets a ship and his flag. Plus he and Usopp also nearly kill somebody. And Nami proves she’s the brains of not just Luffy’s operation, but other small crews as well. Sounds like she could make a lot of berries just hosting “Sea Basics for Dummies” seminars. Ah, so this is when Sanji appears. He’s the cook? Shows how little I know. But that looks like a cool restaurant…from the outside. Although I can see a lot of people going there for Sanji. Yosaku looks like he jumped over from Naruto. Also, I’m sure there are a lot of jokes about “Ironfist Fullbody”. By the way, who hasn’t met a fake know-it-all like Fullbody? Love when they screw themselves over like he did. Meanwhile, cashiers and waitstaff would love to be a Sanji or Patty to rude customers. The epilogues about Buggy vs. The Giant Bird was pretty funny. Also, I just realized I want to see Luffy meet 90s anime Sailor Moon Minako. I want to see who would mix up the most sayings. Put them on a game show all about idioms and see who would win. Any bets? I also want that ice cream cone Luffy has on the back cover. Strawberry, yum yum. Well, of course Zolo was going to meet the world’s strongest swordsman eventually. I can’t say I was expecting to meet him this early. Of course, when Oda was serialzing it, it would not be that strange. “It’s already the sixth volume, you know!” I mean, there were long-running manga in Jump long before the time of One Piece, Naruto, and Bleach, but a lot of 90s Jump hits would probably be considered on the short side now. Yu Yu Hakusho was only 18 volumes long, and Rurouni Kenshin, on which Oda worked, finished at 28 volumes. Compare that to something modern like (in my opinion, lackluster) romance manga Nisekoi. It’s been ranking low in the surveys yet is still going on as of this writing. (It’s supposed to be ending “soon”, whenever that is.) So while I’m sure One Piece was already gaining popularity at this time, I don’t think most expected it to go past 80 volumes. I doubt a modern Jump series would have brought in Hawk-Eye so early. Sheesh, CLAMP would have held off for years before even revealing Zolo’s past. But I can sense a bit of Sanosuke in Zolo, the frustration of thinking you’re strong but being humiliated. Zolo’s three sword style still makes my teeth hurt just watching him. So we continue the battle on the Baratie, and we see Sanji’s and the chef’s code of honor. I was wondering what Nami was up to, and she manages to sweet talk her way to a free meal, and, even better, the treasure. The transforming ship was a nice touch, but the Buggy scenes have overstayed their welcome. They may be setting up for the future, but let readers be surprised. The author’s answer sections about finding Gaimon’s son and then telling the reader to cheap with the son about Gaiman was hilarious. Luffy’s crew is getting bigger, but I’m looking forward to getting out of the “meet someone to recruit, get into a fight” pattern. Nami and Sanji look like they’re getting some key scenes next volume, so I’m looking forward to it. The Don and Hawk-Eye both don’t have as crazy appearances as the other antagonists so far, but I don’t know if this is temporary or signals a shift to more typical (aka somewhat realistic) Jump flair. What isn’t typical is the fact Luffy keeps inviting people to join his crew right away. A lot of shounen series has the former enemy tagging along after a defeat, but Luffy is much more proactive about meeting people. It really makes him stand out compared to other protagonists who get stuck with their main group of friends.